She remembered when her sisters died. She had seen many deaths before; many ships had wrecked upon the rocks of the island. But these deaths had almost all blurred together in her memory, while the deaths of her sisters remained distinct. Their shrieks had been the last sound to reach each corner of the island. Anthemusa was quiet now, quieter than it had ever been. Only the occasional chord of harp music penetrated the silence, and the sound of a harp always grew dull without accompaniment. They had never feared death, those three sisters. They were immortal, and the difference between a day and a year was meaningless to them. They were the sirens, the daughters of the earth and the sea and the sky, and they were as beautiful as any mortal woman, though they had wings twice as long as they were tall, and talons like those of fierce birds of prey with claws that were shining brass. She had always played her harp, almost constantly, until the day her sisters died. For hours, perhaps even for days (or maybe even longer-it was hard for her to know), she let her harp be silent, and there was no sound on the island except the sound of the waves lapping against the rocks. She had not heard silence in such a long time that she had almost forgotten what it sounded like. Her sisters had always been talking or singing, even when she herself had let her voice grow idle and her harp music fade away. Her sisters though, they always sang, and their songs brought visitors. Men sailed to the island-never intentionally, for none could find the island that sought to do so-and heard the song that the sisters sang, and were enraptured by the honeyed notes. “So their ships will crash on the rocks, and we can feast on their flesh,” said her sister Mapsaura, the swift wind. “We can’t live on flowers,” answered Mapsaura. “Why do you ask that question, Celaeno?” asked Aello. “We’ve always sang our songs, since we were born, and men have always sought to hear our voices. “I don’t know,” answered Celaeno, shrugging her shoulders and letting her wings drape around her. She did know the reason. Sometimes when her sisters sang, she sang with them (though never as loudly or as clearly, and her voice was not as beautiful as her sisters), and sometimes she played the harp (though it was always just accompaniment to her sisters voices, and she still sometime struck a sour note), and sometimes she was simply quiet and listened. There were secrets in their voices, secrets that no one else knew, secrets given to them from the depths of the Earth. This was what made their songs so compelling. The sailors who came to the island would listen to the secrets that were woven into the songs and wait until the cold grip of the sea claimed them. But her sisters didn’t hear the secrets. They were too busy listening to their music-and their music was beautiful, after all. The notes that came from their mouths were more beautiful than the notes of any harp or the song of any mortal musician. So they heard their songs, but they didn’t listen. Celaeno listened sometimes, when she let her voice grow quiet and she plucked on the strings of her harp. She heard their stories, and remembered every word. She learned the pasts of the sailors; she saw the faces of their parents, heard their laughter when they were children. She saw the futures that they almost had; she saw them fall in love, and marry, and have children; she saw them grow old, and saw the earth claim them again. But then she saw the futures that they truly had, as they clung to the rocky shores of Anthemusa, just to hear a single song, a single chord, a single simple note. One day when she saw that a ship was headed towards their home, she picked a spot close to the shore-as close as she possibly could sit without risking being claimed by the ocean’s waves-in preparation for the song that she and her sisters would soon begin to sing. She played her harp and sang softly, while her sisters allowed their voices to be carried high up into the wind. And as every time before, the ship turned towards Anthemusa, lured by the honey of the sister’s voices. The sailors ignored the clear danger that the rocks presented, for the only thought in their minds was to get closer to the source of the music that they heard. And just as every time before, the ship wrecked on the rocks, spilling its cargo and its crew into the craggy sea that surrounded the island. The sailors clung to the rocks, but they made no attempts to climb up onto the island. All they wanted was to hear the sisters sing-they cared not for their own lives. Most of them swam to the rocks that sat under the perches of Mapsaura and Aello, for they sang far more beautifully (and far more loudly) than Celaeno ever could. She tried to lift her voice to match theirs, in hopes that she could lure just a single sailor to her perch, but always the voices of Mapsaura and Aello grew clearer and louder. But Celaeno’s voice caught one man’s attention. He had grabbed a rock closer to Celaeno, and had heard her voice before her sister’s voices could enrapture him. She saw him clinging to the rocks, and she tried to drown out the sound of the sea, and the sound of her sister’s songs, and the sound of the men drowning in the briny waters. She wanted to hear the words of her song instead of losing them to the music that was wrapped around them. The sailor blinked as she sang her new song. He looked up at her, and held out his hand. She let her harp nearly fall into the sea as she leaned towards him, but she stopped short and pulled herself back onto the rocks. He stared at her, closed his eyes, and began to swim away from her, and from the island. That had not been the last time that she did this. The last time grew quiet so she could listen was when Odysseus had sailed by their home. She hadn’t expected it to be the last time-but no one ever expects their family to die before their eyes. There was no one on the island to drown out her voice anymore-but there was no longer anyone there to listen. Perhaps it was because she had stopped singing-but she thought to herself that even if she started singing again, no one would come. Their song was only beautiful when her sisters were the ones singing. For the first few days, she withdrew to the center of the island, drinking the dew off the flowers and subsisting on little else. All she could hear was the sound of the waves crashing on the island; Anthemusa was a small place. Eventually, she picked up her harp again, and began to play, singing softly to accompany the tune. At first her voice could barely be heard above the sound of the harp and the ocean, but slowly her voice built up higher. She sang for some time, and did little else. Days and weeks and months were meaningless, with nothing to distinguish one from another. One day, when the playing the harp had grown tired and dull, a bird arrived at the island, and sat and listened to her sing. It was a seagull, and Celaeno knew what a seagull meant; there was a ship coming. She quieted her voice, and looked beyond the horizon. There were more birds, flocking over something that was drifting to the ocean. There was darkness as well, gathering slowly, and flashes of light. She held out her hand, and the seagull alighted on her finger. “Hello, sea-bird,” she whistled to the gull. “A storm?” she asked, already knowing the answer. She had seen storms before; her sisters loved them. Storms brought ships to their island-and ships brought sailors, who would gladly drive their ships into the rocks to hear the sister’s song. Even if their ship sank, if the sailors heard but a note of their melody, they would gladly swim for miles to reach Anthemusa. They perch themselves on the rocks and stare up at the sisters and listen to them sing until exhaustion overcame them and they sunk into the sea. The seagull flew away from his perch on her finger, and Celaeno dropped from her seat upon the rocks of the island and spread out her wings wide, catching the updraft from the hot rocks of the island. Her wings felt heavy and tired-she couldn’t remember the last time she had flown. She never seemed to have need of it before. The ships always came to Anthemusa before they wrecked. She soared into the air, looking down at the wreckage that bobbed along the ocean waves. She scanned the water, looking for the slightest bit of movement that would indicate a survivor. She saw a ripple in the water, and saw dark shapes swimming below a figure clinging to a rotting plank of wood. She swooped down towards the survivor, hissing at the circling sharks. She grabbed the man with her talons and pulled him up, heaving him skyward with all her strength. As she did so, she heard him choke, and expel water from deep in his lungs. She flew as swiftly as she could, and deposited his body on the soft purple flowers of the island. She looked at his face, and recognized him instantly. His hair had become white from age, his skin was wrinkled and blemished, and his arms with weak and bone thin, but she remembered him. She had watched him sail away, when her sisters flung themselves onto the rocks. “Has it been so long, Odysseus?” she asked, as he opened his eyes and lifted himself up from the ground. “When I sang your song, I heard you die. I saw you die. How have you lived so long, Odysseus?” she asked him. “Why have you come to my island, Odysseus?” she asked him. “Is that why you are immortal now?” asked Celaeno. “Have you found such a place?” Celaeno asked. “That would be a wonderful gift for a mortal,” said Celaeno, smiling. Celaeno turned from him, and went to the edge of the cliff. She looked down at the rocks, where her sisters had chosen to shed the gift of immortality. She wondered at their choice, which seemed more inviting now. Instead, she sat, and stared into the gentle ocean. The sea had grown calmer since she rescued Odysseus, and the sky was dark, not from storm clouds, but from the veil of night. She began to sing, but the notes of her song only served to choke back the sobs that emerged from her throat. She let the music that came from her voice grow soft and fade away, and she let her tears fall into the ocean. Odysseus said nothing. He walked to the other side of the island, and drank some of the dew that was still on the flowers. He was ready to wait, and to sleep. He had an eternity to prepare for. “I carried you to the island,” said Celaeno. “You barely made it to me,” snorted Odysseus, who was apparently still listening to her. Celaeno did not respond. Instead, she walked to the ledge where her sisters had sat before they had thrown themselves into the sea. She looked up at the sky, which was clear and black, and then out at the ocean, which seemed to be almost as still as glass. And then she looked down on the rocks where her sisters had thrown themselves when Odysseus had first passed by their island. She could see many bones on the rocks below her, but she could not tell which bones were those of her sisters. The sea had stolen any trace of identification from them, leaving them all bleached as white as death itself. She stepped off the edge of the island, and fell forward to the rocks. Odysseus, though he had cloistered himself away from her, saw her action, and laughed. He had known what fate she would pick. His laughter did not last, for Celaeno did not allow her life to be snuffed out upon the rocks. She spread her wings and rose up into the air, and the only part of her to join her sisters were a few errant feathers. Odysseus cursed at seeing his clever prediction come undone. He raced to the edge of the island where Celaeno had taken flight, and digging his hands into the dirt he pulled up a few smooth round stones. He threw the stones at her, hoping to summon up just a small portion of the might that he had possessed when he was a hero and a favorite of a goddess-but the stones flew much too short and much too low, and not a single one threatened Celaeno. It was Celaeno’s turn to laugh now. Anthemusa grew small and distant, before disappearing behind the horizon. For a moment, then, Celaeno was joyful. But the joy was not to last. She soon felt her wings growing tired and heavy. She no longer was flirting with the clouds, but was instead growing closer to caressing the waves. She struggled to lift herself higher, but failed. She looked back, hoping to see that Anthemusa was still within her reach, that she could still return there if she tried-perhaps even swimming. But Anthemusa was gone, and Celaeno then realized she could not find it even if she could swim. She had no point of reference-all she could see was the clear blue sea. So she dropped into the sea, and felt the ocean’s icy grip begin to take her, just as it had taken all the sailors that she had seen die. She felt it drinking the heat away from her, and with her wings already tired from flying, she did not resist. She let the ocean claim her. But then she felt hands, all over, clasping at her feathers and holding tightly on her mouth. She opened her eyes-just barely, as the saltwater stung fiercely-and saw before her dim forms, dark and blue and green. Celaeno closed her eyes as tightly as she could, for the stinging of the saltwater was growing nearly unbearable. She felt fingertips travelling along her eyelids-the fingers were cool and soothing, and she found that the pain was seeping away. The hand that was placed over her mouth moved away, and Celaeno found that she could breathe the ocean’s water as easily as she could breathe the air of the sky. She could see clearly now through the waters of the sea, and she saw that all around her swam the children of the ocean, or, as mortals called them, mermaids. “Why have you left your home, song sister?” asked one of the mermaids, whose voice rang out like the sound of bells. “But you did not end your life,” said another mermaid, whose voice was like the plucking of the strings of a harp, gentle and sure. Celaeno closed her eyes, smiled, and nodded. She felt the three mermaids converge on her, and she felt hands tugging at her wings. She felt her feathers being pulled away, but she felt no pain-only the slightest of pressure. Her feathers spread out into the sea, each dark and silvery, and as they floated they changed, darting out like fish. When she opened her eyes, the clutch of the ocean no longer held onto her throat, and she found that she could move as easily as the three sisters could. Her feathers were gone, having formed a school and swam away, and in their place were scales, green and blue. So there are no sirens any longer. But there are mermaids, and the song of the mermaids are as beautiful as those of sirens. And Celaeno sings whenever she wishes, and people do listen. Chris Pearce is an aspiring writer. He has been previously published in Sanitarium Magazine and Mirror Dance. Despite the best efforts of authorities, he remains at large. Write! And keep writing. Even if you start from a very simple idea-- maybe just an image or set piece in your head-- it can end up taking you to amazing places by working out from it-- or by trying to figure out a way to work up to it. 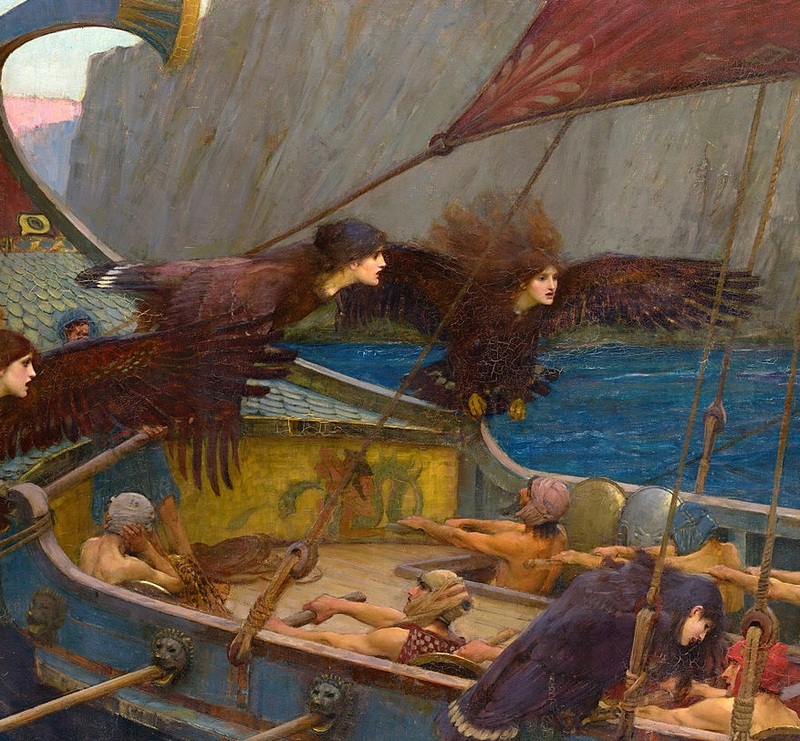 This story, for example, was inspired by the fact that sirens are described as having bird features in the Odyssey, but end up having fish features in most art.